Review of Melbourne’s Bicycle network and improve traffic flow in the City. End Traffic Congestion by fixing LaTrobe Street and other cross city roads. Safer roads for (All) users including Pedestrians, Motorcyclists, disabled and the elderly Commuter Parking. Shared access to the Road Network. Trade 7 days a week. Establish a Strategy Plan to increase activities to make Melbourne more family friendly. Increased accountability and transparency. Reduce expenditure lower rates. Review of Melbourne’s external boundaries and electoral system with the aim of establishing a Greater Melbourne City Council that incorporates City of Port Philip, The former City of Prahran and the City of Yarra with 21 Councillors (3 members x 7 wards) . MetroRail Stations to include local shops and services. Tunnel under Punt Road between the Yarra and Nepean Highway and grade separation along Hoddle Street. State Government: Avoidance is best policy? 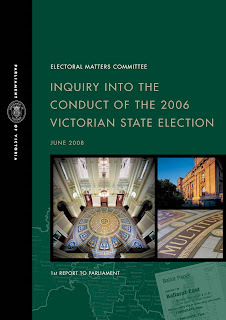 In a letter received by Mr Dan O’Brien, Victorian State Premier John Brumby’s Chief of Staff, dated Wednesday April 14, 2010 Mr O’Brien indicated that the Government does not intend on holding a review into the 2008 Municipal elections thus avoiding any potential embarrassment that an inquiry would expose. There are a number of issues and complaints related to the conduct of the 2008 Municipal elections and the lack of transparency in the election process. It’s been just under 18 months since Victoria went to the polls to elect it’s local government representatives. 18 months and the parliament still has not initiated a review and it is unlikely to do so willingly. The State Government is facing an election year and wishes to avoid any controversial issues. If a parliamentary review into the 2008 Municipal elections was held a number of issues that the government failed to address would be brought to the surface. Closing their eyes, ears and mouth is not the sign of a strong confident or responsible government. The much needed parliamentary inquiry into the 2008 Municipal elections should be held without delay. that I respond on his behalf. Tens of thousands of Victorian voters have been disenfranchised with hundred of voters turned away from Town Hall on Saturday expecting the right to vote. No effort was made by Town hall to register the names of disenfranchised voters. These voters are subject to a $57 fine. The VEC has refused to provide statistics on the number of late vote returns for each municipality. Whilst some municipalities held attendance voting last Saturday most Council’s opted for a Postal voting system where the voting closed earlier on a Friday. many voters are angry that they will now face a fine for not voting. In the past they are use to voting taking place on a Saturday with many City shoppers and business people expecting they could cast an absentee vote. Another candidate has written to the VEC requesting a manual count and or presorting of the ballot papers prior to computer data-entry of preference votes. Any savings in time by not presorting the ballot into primary votes(Which is debatable) come at the expense of the scrutiny of the electronic ballot denying candidates the right to an open and transparent count. After consultation with Shelley Roberts we would like to support a manual count of the Lord Mayoral vote. We believe that this will enable a more open and transparent process than the proposed computer only count. We can understand the usefulness of a computer system in the more complex councillor ballot (but even here the presorting, checking and manual count of primary votes would be appropriate). We believe that the straight forward preferential nature of the simpler Lord Mayoral ballot (the same as state and federal lower house ballots) lends itself to a manual count with easier scrutineering. If it is your decision to proceed with a computerised count,we would request that the ballots be at least sorted, checked and counted according to primary vote prior to any data entry. Nothing in this request should be taken to reflect on or infer in any way a want of confidence in you and your dedicated staff, rather we have a preference for a simple manual count which would avoid any inadvertent mistakes during data processing and allow scrutineers to undertake their role in the more tried and true fashion. on behalf of Shelley Roberts. The Victorian Electoral Commission is set to repeat some of the mistakes they made in 2006. Bill Lang, Melbourne City Council’s Returning Officer, has refused calls for the Lord Mayor’s election to be counted manually. There is no justification for a computerised data-entry count. A number of candidates in the election have supported the call for the count to be open and transparent. If the computer count is to proceed then the VEC should presort ballot papers prior to batching them ready for data-entry. Whilst there is nothing in the legislation that requires a presorting of the ballot, other then the obligation to ensure that the election is open and transparent, there is nothing that prevents the VEC from presorting ballot papers into primary votes, as is the case in Senate elections. The election of Lord Mayor of Melbourne is expected to be close and the presorting of ballot papers would significantly assist in the orderly scrutiny of the ballot whilst maintaining an open and transparent counting of the ballot. Without presorting of the ballot it is impossible to effectively scrutinise a computerised data-entry count of the election. By refusing to initiate a presorting of the ballot papers the VEC has thumbed its nose at the State Parliament demonstrating its level of contempt and inability to self-regulate the conduct of the election in order to maintain an open and transparent electoral process. A complaint has been forwarded to the Minister, Richard Wynne and the Victorian Parliamentary Electoral Review Committee. Antony Green, ABC Election WHIZ kid, has just confirmed what we have been saying for years. To top it up he has also done a detailed analysis based on our hypothetical situation designed to highlight and demonstrate the serious flaw in the way in which the Government counts elections. Using the 2007 Victorian Senate Election results and the “what if” scenario of One Nation preferencing the Liberal Party before the ALP and then the Greens. Under the Government’s flawed system the Greens would have received an added vote bonus of around 7,000 votes. Affirmative Action for minor parties. This is 7,000 additional votes that the Greens did not win but the system gave them. The Greens Candidate would have been elected in Victoria unfairly instead of the ALP’s David Feeney. Using a correct proportionally weighted system, as we have been advocating, David Feeney’s election would have been secured. The problem we identified is exponentially magnified when the system is applied to smaller electorates, such as Victoria’s Local Government Elections. For those municipalities that do not have “Above the line” voting the potential of being disenfranchised by the system is even greater. Last week we made a plea to the State Parliament to address this issue and implement change before the November Poll. Western Australia has done it now it is Victoria’s turn. Rather then just fix the problem with the way in which they calculate the Proportional Surplus Transfer Value were are also advocating a fix for the flawed “Segmentation system“. The system in use was designed for larger electorates (Such as the Senate) and was implemented to assist with a manual count. With the advent and use of computer based technology now is the time for change. One Nation had lodged a preference ticket that had Labor ahead of the Liberal Party, with the Greens last. If One Nation had put the Liberal Party ahead of Labor on the ticket, then when Family First was excluded, Labor’s David Feeney would not have reached a quota and the preferences of the Liberal Party’s surplus to quota votes would have been distributed. What is even more remarkable is that if One Nation had put the Liberal Party ahead of Labor, then the Greens’ Richard Di Natale would have won the final vacancy, not Labor’s David Feeney. This would have occurred due to the formula used by the AEC to weight votes when determining the preferences of surplus to quota votes. There are different methods in which preferences can be weighted. The purpose of this discussion is to look at the different ways in which votes could be weighted and the impact this can have on a Senate Count.